ZIP - Zero Installation Purifier Countertop Reverse Osmosis Water Filter. No Installation Required. On the move, no problems. No installation, no connections required, just take it out of the box and start using it. Perfect for Renters, College Students and etc. It comes with 75 Gallons per day membrane and makes ½ a gallon of pure water in under 10min. Suitable for City or Well water source. 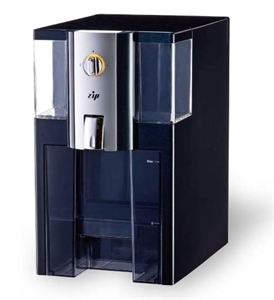 ZIP Four Stage Counter Top Reverse Osmosis system begins with stage 1, a five micron Sediment filter that traps particulate matter like dirt, rust, and silt that will affect the taste and appearance of your water. Stage 2 is a GAC- Granulated Activated Carbon filter that provides a reduction of chlorine and other materials that cause bad taste and odors. Stage one and stage two filters are called PRE-filters because they filter in front of the reverse osmosis membrane). Stage 3 is the heart of the reverse osmosis system, the RO Membrane. This semi permeable membrane will effectively remove TDS (total dissolved solids), Sodium and a wide range of contaminants such as Percolate, Chromium, Arsenic, Copper and Lead. It will also remove cysts such as Giardia and Cryptosporidium. Stage 4 is a high quality Alkaline Post Filter (this is called a Post filter because it filters after the membrane). This filter is final polishing filter used as the water is leaving the membrane on its way up to your glass. It returns beneficial minerals to water- Calcium and Magnesium. It also Increases water Ph to alkaline level. The end result? Great tasting water! Capable of making 75 Gallons of Pure water = 567 of 0.5L water Bottles a DAY! Continental US Free Shipping: FedEx Ground Home Delivery. Get it within 3-5 Business Days.